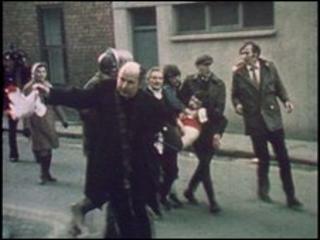 The picture of a priest waving a bloodstained handkerchief as one of the victims, Jackie Duddy, is carried to safety is perhaps one of the most enduring images of Bloody Sunday. Father Edward Daly was then a 39-year-old curate at St Eugene's Cathedral in Derry. On Bloody Sunday he joined the march it as it passed the cathedral on its way to the city centre. He was standing near 17-year-old John "Jackie" Duddy when he was shot. "We tried to help him. I said a prayer with him and I anointed him and gave him the last rites," he said. "We decided to make a dash for it. "I went in front with this handkerchief in my hand and they carried Jackie behind me. "All hell was let loose. "We were very nervous and frightened and when we laid him down on the pavement he had died." In an interview with the BBC on Bloody Sunday, Fr Daly condemned the army's actions as "completely outrageous". "They were firing lead bullets in all directions. "They call themselves an army, it was utterly disgraceful. "There was nothing fired at them, I can say that with absolute certainty because I was there. "The people were running in all directions. Most of them had their backs to them and they just opened fire." Dr Daly first arrived in Derry as a priest in June 1962. In 1974 he was appointed Bishop of Derry, a post he held for nearly 20 years before he retired after suffering a stroke. In his evidence to the Saville Inquiry, Bishop Daly said he felt a personal duty to do what he could to establish beyond doubt the innocence of those whose death or injuries he witnessed on Bloody Sunday. He became emotional as he described how he fled from the soldiers across the car park of Rossville Flats. Jackie Duddy was beside him. "A shot rang out. It was very clear over the general noise. "Simultaneously he gasped and fell on his face behind me, just a few feet away from me. "There was no threat posed to the army at the time they opened fire, none. I don't think there was any justification for it." He spoke of scenes of chaos as "a mass of frightened and panic-stricken people" jammed the two entries of the high-rise flats to escape the troops." Speaking to the BBC in 2000, Bishop Daly said he was "full of hope" for the Saville Inquiry. "The inquiry means a great deal to the families of those who died and those who were wounded. "It also means a great deal to those of us who were unfortunate enough to witness those events. "The events of that day have haunted me for all these years," he said. "I hope that the truth of what happened and the precise reason or reasons for what happened on that terrible afternoon are established beyond doubt."